Forty years ago tonight America was bringing to a close a year that saw much turmoil and unrest. America's survival through the problems at home and abroad that marked the sixties was tested as we struggled to find ourselves through the assassinations of Robert Kennedy and Martin Luther King, the civil unrest, the VietNam War and the changing of the guard as a new President-elect was waiting to lead the country out of what had proved to be the disasterous year that what 1968. One of the few bright spots came on this night, Christmas Eve of 1968. Three men from planet Earth became the first humans to circumnavigate around the moon. A daring adventure that showed the world what America could do at her best even in the worst of times. 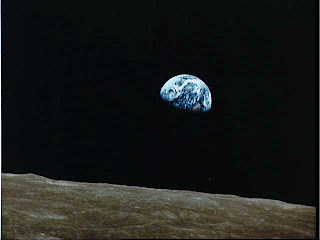 The Apollo 8 crew of Frank Borman, Jim Lovell and Bill Anders became the first to see the Earth rise above the lunar horizon and realized that the entire history of humankind and every single person they'd ever known could be hidden behind their thumb. They took turns reading a passage from Genesis in the Old Testament and helped all of us see the wonder of our own little spot in the universe. After their return the crew received numerous letters from citizens around the world. One note simply said "Thanks for saving 1968". Forty years later America is struggling through a year of uncertainity and crisis, there will be no heroics that will "save 2008". We have a new President-elect and as we saw in 1968 even through the worst of times America will rise again. On this night we remember those that are far from home, those that have lost friends, family and loved ones, those without food and shelter, and those that are affected by the difficult times we are in. The lesson of Apollo 8 is that we can do great things and we can survive tough times if we rely on our spirit and the talents in each of us take bold steps to move America forward again.